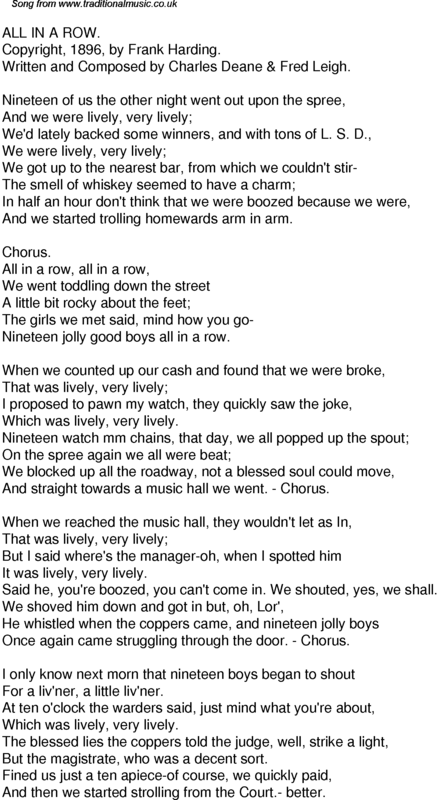 Written and Composed by Charles Deane & Fred Leigh. And we started trolling homewards arm in arm. Nineteen jolly good boys all in a row. Which was lively, very lively. And straight towards a music hall we went. - Chorus. It was lively, very lively. Said he, you're boozed, you can't come in. We shouted, yes, we shall. Once again came struggling through the door. - Chorus. For a liv'ner, a little liv'ner. But the magistrate, who was a decent sort. And then we started strolling from the Court.- better.